That's right, no pausing until you finish the game! Also, you're stuck with 1080p, 16:9 aspect ratio. Don't match that spec? You'll get letterboxed. Tough. Just like school was. 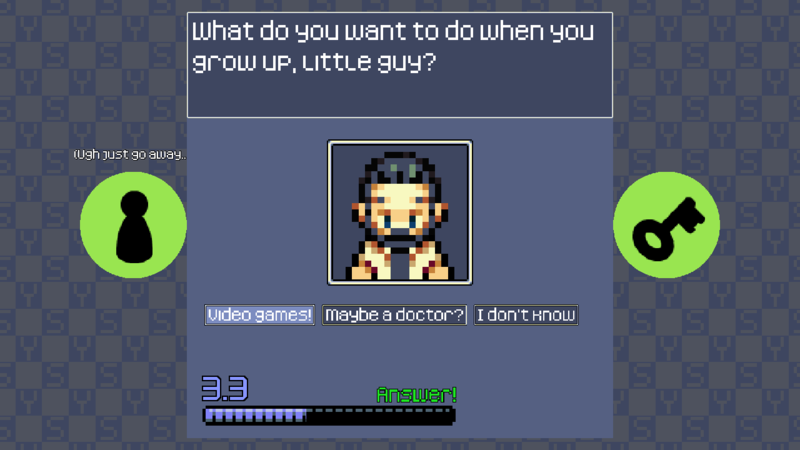 How did it feel for me to "grow up"? In my grade school years, life was very much dominated by academia. Get these grades, focus on school, prep for college! Those are the priorities, everything else is secondary! To me, growing up felt like a slew of snap decisions, reflex-reacting to various scenarios, and otherwise not being in full control of my life. To me, it felt like a WarioWare title. Which brings me to School Years! 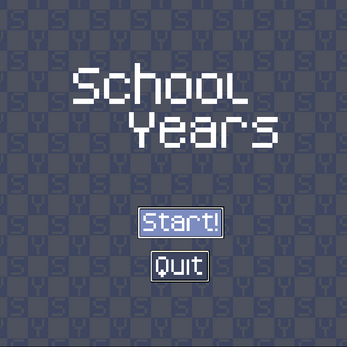 School Years is a quick-paced, pixelated entry into the first CFN Game Jam, for which the theme was "growing up". In it, you can experience a not-exhaustive-at-all synopsis of my grade school years, with gameplay heavily inspired by the WarioWare series. At the end you'll have a tally of wins and losses, the latter of which includes those decisions you let life make for you (namely, when your timer ran out). Try to take control of school life and make those decisions! My main objective in making this game was to finally complete a project using the Godot game engine. I've been meaning to make a game using the Godot engine ever since hearing/learning about it, with the CFN Game Jam seeming to be a perfect opportunity. It was an absolute treat working with the engine, and 3.0 release definitely deserves the hype. On the devlog you'll find a postmortem detailing the process behind School Years' development; click right here to take a look! School Years was built with Godot engine. 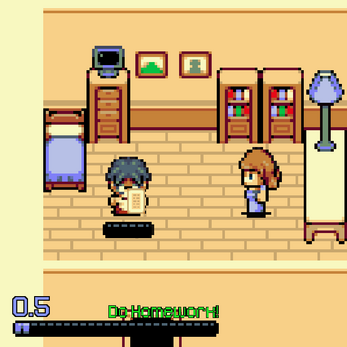 Player/background sprites, objects, and button frames were provided by the Old School Modern Asset Pack by finalbossblues. Kenney's extensive Game Assets packs provided minigame icons, the KenPixel Nova font used throughout, and music loops used during minigames. Aseprite was used to edit or otherwise modify the above assets as needed. Any other visual assets were made by me in Aseprite. All other sound not provided by the above assets was composed by me, using the CompiFONT sample library in LMMS. Check the box next to "Override high DPI scaling behavior"
This will prevent issues with over-sizing that the game seems to experience in high DPI systems. It was pretty fun, but I still find it weird that "L" would be used to confirm. I thought it would be better with "Enter" or maybe "Space". It was still fun though, and I really liked the pixel art. They were cute. Thanks for playing! Glad you enjoyed it. 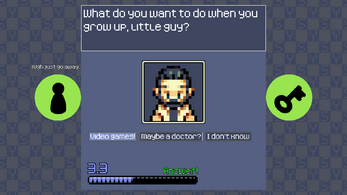 The control choice was part of the theme of "Growing Up". When I first played PC games when I was younger I would play any classic style platformers with K and L as analogues to B and A on an NES, since "arrow keys + z/x" felt, and still feels, really weird to me. Similarly, F and H were always "Select" and "Start" for me. If this was any other jam theme I most definitely would have gone with Space as I agree it's more intuitive of a control for "accept" or "do". Maybe I went a bit to hard on the theme relevance lol. Glad you liked the art! I'll take credit for manipulating the assets and laying them out, but finalbossblues' asset pack is the real hero there. Also Kenney's KenPixel Nova font from his first asset pack, so good! I liked it, but it was very confusing. I think a portion of the UI was cut off in full screen. Yep, that would be the DPI scaling issue I mention in the Install Instructions section, if you're on Windows. Not sure how to solve it on other platforms yet as my current main platform is Windows. Following the steps there should solve the problem if Windows is your OS, if not, changing your DPI scaling settings in your OS should solve it there. Thanks a ton for doing a video on it though, glad you liked it! The confusion is more or less intended :) WarioWare was big on that. Thanks, means a lot! Can't wait to make some more, I'm feeling inspired!